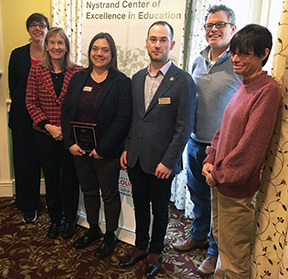 The College of Education and Human Development (CEHD) and the Nystrand Center of Excellence have a rich history of service to the community and commitment to collaborative efforts with our public schools. Nearly 20 years after the Center was named in memory of Dr. Ray Nystrand, who served as Dean of the CEHD from 1978 to 1999, his legacy of support and transformation of education continues through our strong community partnerships, and the endless work of our faculty, staff, program coordinators and directors, school district administrators, and teaching faculty. As the Center Director, I feel fortunate to work with so many P-20 colleagues, both at the college and in the public schools, who are strongly devoted to advancing education beyond the 21st century. The unwavering commitment to prepare our teachers and their students is beyond commendable. We will strive to further advance the mission of the center, continuing the work of directors before me, and carrying on the legacy of Dr. Nystrand. The 2019 Nystrand-Offutt Scholar is Dr. Jessica Hardy, Assistant Professor in the Department of Special Education. She was selected for her proposal, "Designing Inquiry-Based Science Centers and Embedding Systematic Instruction: Collaborating with Teachers and Measuring Impacts on Children in Inclusive Preschool Classrooms." She will work with four preschool teachers to design and implement a science curriculum in their classrooms and provide systematic instruction to preschoolers with disabilities. Dr. Hardy will measure the science learning of children with disabilities throughout the intervention and will also conduct pre- and post-measures with all children in the classroom. The results of the study and procedures will be disseminated through research journals and practitioner journals. The Nystrand-Offutt Scholar is supported by Nancy and George Stablein through the Offutt funds named for Nancy’s parents. The Nystrand-Offutt Scholar is an early career faculty member engaged in research related to the Nystrand Center's work. The funds provide time for the Scholar to conduct research during the spring semester, analyze data and write during the summer, and travel to present about the work at a national conference during the following year. Applications are accepted each fall. 2018, Dr. Stephen Tucker, "Fingu: Understandings of Number in Kindergartners' Embodied Mathematics"
2017, Dr. Ann Herd, "Veterans' and Employers' Perspectives on Military Transition Experiences"
2016, Dr. Sheron Mark, "Culturally Relevant STEM Education: A place for Art and Social Justice"
2015, Dr. Stefanie Wooten-Burnett, "The Development of Elementary Teacher Candidates' Teacher Efficacy Through the Use of Cognitive Coaching"
2014, Dr. James Chisholm, "Using Backchanneling Technology to Enhance Adolescent's Response to Literature During Inquiry-based Discussions," and Dr. Rob Pennington, "Collaborative Partnerships in Writing Research for Students with Intellectual Disabilities"
2013, Dr. Jill Adelson, "Cognitive Coaching and Gifted Learners: Examining Effects of Student Achievement and Academic Self-Concept"
2012, Dr. Shelley Thomas, "From the Institute to the Classroom: Is Culturally Responsive Teaching Becoming Part of Teacher Practice?" 2011, Dr. Monica Delano, "Reading to Engage Children with Autism in Language Learning (RECALL)"
2010, Dr. Kristi King, "Project BALANCE (Beneficial Activity Levels and Nutritional Choices Everyday)"
In 1987 the Center for the Collaborative Advancement of the Teaching Profession was established by the Kentucky Council on Higher Education, with support from the Governor and the General Assembly, as a result of a joint application by the University of Louisville and Jefferson County Public Schools. With the approval of the Council on Postsecondary Education and the UofL Board of Trustees, the Center was renamed the Raphael O. Nystrand Center of Excellence in Education on September 27, 1999, in honor of Dean Nystrand, who led the School of Education from 1978 until his death in May 1999. The purpose of this Center, which is one of five Commonwealth Centers of Excellence and the only one in education, is to develop, implement and study collaborative efforts to improve teaching. The Nystrand Center is grateful to all those who make its work and vision possible, and who support our ability to maintain the legacy of former Dean Ray Nystrand, for whom the Center is named. 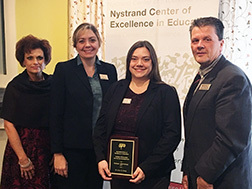 Transformation through Collaboration: The Nystrand Center of Excellence in Education is dedicated to the continual support of educational excellence for all students made possible through innovative thinking, transformational educator preparation, professional development, and supportive learning environments. The Director of the Nystrand center is Dr. John Finch. The Center currently has a number of special initiatives under its umbrella that are led by faculty from across the CEHD. For more information about the Center, or its projects, e-mail Denise Dadisman, or call 502-852-3408.